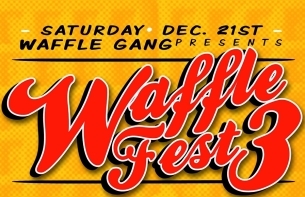 Buy an advance ticket online by and you’ll be entered to win a plate of food + a Waffle Gang Gift Pack, courtesy of - you guessed it - The Waffle Gang! The lucky winner will be selected on Saturday evening, so check your e-mail to see if you win and get ready to party. Tonight we are co-presenting a delicious hip-hop showcase with the brain behind Waffle Fest, SHAWN CHILDRESS. The show, which starts at 8pm, and will feature short sets by Milly Mango, DJ Edikut & Steady Serve, CoJack, James Christos, St Millie, Substance, Jam One, Demond James, Billy Tuggle, Metasyons, Chris Crack, Rashid Hadee, MATLOCK, Pugs Atomz, and Awdazcate. Throughout the night we will have DJ sets by Mulatto Patriot, DJ ALO and DJ Gant Man. There will also be chicken & waffles throughout the night, served in the game room. This is going to be the most delectable party we've hosted in a long time, so wipe the drool from your mouth and join us for a killer hip-hop party on a FINE December evening.